This is one of these recipes where I just do what I do, not making notes, and end up with an exquisite result. My recommendation is that you regard my quantifications with a pinch of salt. Use my ingredients and experiment in order to give this recipe you particular character. Parmesan cheese and more truffle oil to add to the dish. Fry onions lightly in oil. 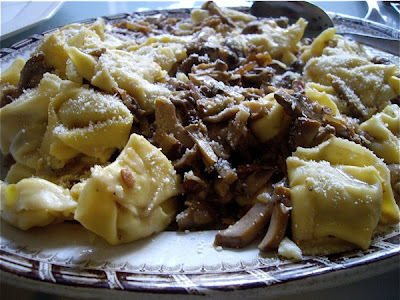 Lower heat, while adding fresh mushrooms, place lid on casserole and allow mushrooms to wilt (sweat), slightly. Add flour, and stir into ingredients, to avoid lumps. Then add stock. Stir until sauce thickens. Balance the salinity with balsamic vinegar or sugar, before adding pepper and stirring in truffle oil. This exquisite ingredient adds a "je ne sait pas quoi" aroma that will impress your guests. Add cream at the end of cooking time. Check balance is to your taste. Sprinkle freshly ground parmesan cheese and more truffle oil for extra taste.